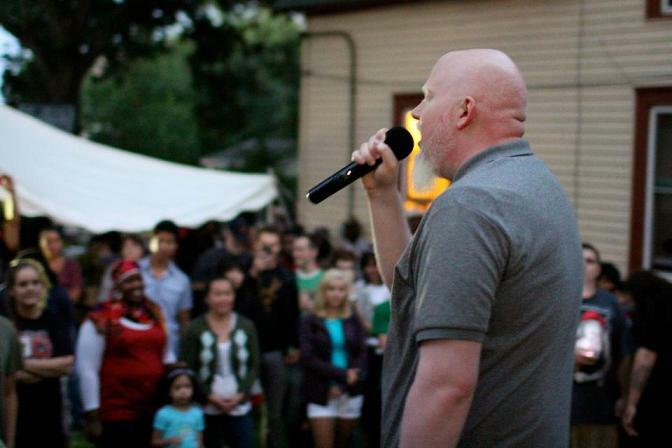 Internationally renowned hip hop artist Brother Ali at a picnic on Aug. 8, 2012, following an Occupy Homes national convening in Minneapolis, MN. Brother Ali was one of many activists arrested in June as part of an ongoing Occupy Homes MN effort to save the Cruz home in south Minneapolis. Fully recharged and inspired by his eye-opening first trip to Mecca, the 2011 uprisings in the Middle East, and the world wide Occupy movements, Brother Ali is prepared to unveil his fourth full-length offering Mourning in America and Dreaming in Color. Created during a self-imposed two-month exile in Seattle and helmed by platinum-selling producer Jake One (50 Cent, T.I., Wiz Khalifa), the album presents a scathing yet honest critique of America and its many flaws while simultaneously presenting a hopeful outlook of its possibilities. Preceded by the release of free music downloads with accompanying music videos such as “Shine On,” “Writer’s Block,” and “Not A Day Goes By,” Mourning in America and Dreaming in Color is the pièce de résistance.